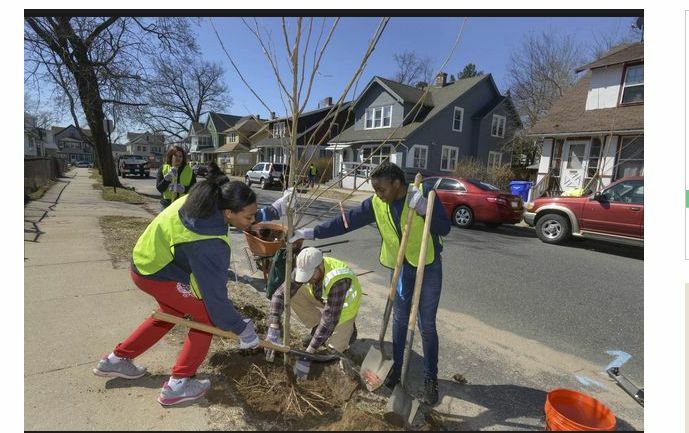 Rick Harper, University of Massachusetts assistant professor of urban forestry, center, with help from High School of Commerce students Breyonno Jones, left, and Kelen Dessources, right, and Alexandra Santiago, behind them at left, plant a tree on Rochelle St. in Springfield Massachusetts Thursday, April 10, 2014. Commerical and school volunteers planted 41 trees here and on Annawon St., part of a regional effort to reforest urban areas. The project today was lead by ReGreen Springfield with help from the Springfield Forestry Department and sponsored by Berkshire Bank.